← AWAKE…One Word, Express In One Hundred Words In One Hundred Days. DEFINITION…One Word, Express In One Hundred Words In One Hundred Days. 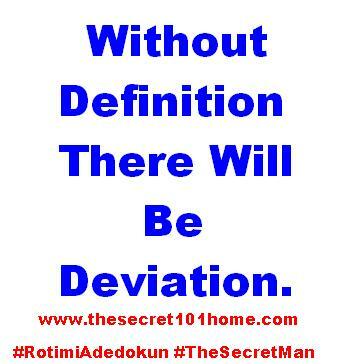 Without Definition There Will Be Deviation. Self Definition Checkmates Actions, Determines Involvement And Empowers For Influence. As Definition Is The Key To Living. So Assumption Is The Mother Of Frustration. Lack Of Definition Is The Source Of Displacement. If You Follow Pattern You Will Not Be Batter. Remember If Purpose Is Not Known Abuse Is Inevitable. Success And Failure Are Predictable. If You Know What You Are Suppose To Do And Do It. If You Know Where You Are Suppose To Be And You Are There. You Will One Day Get Whatever That Belongs To You. This entry was posted in Life and Time Management, The Secret, Vitamin Of The Mind, You! and tagged Bishop David Oyedepo, Definition, How to define life, Jim Rohn On Self Definition, Life Definition, Pastor E A Adeboye On Life, Rotimi Adedokun On Self Definition, Self Definition, The Power Of Definition. Bookmark the permalink.